Muhammadu Buhari has said on many occasions that the unity of Nigeria is not negotiable. This is laughable because it is obvious to the world that Nigeria has never been united. The unity of Nigeria is only a euphemism for the continous subjugation and exploitation of Biafra and her resources. Alhaji Abubakar Tafawa Balewa said “The unity of Nigeria is only a British invention." And this is absolutely true. The struggle to unite Nigeria ab-initio has yielded zero result till date, because the indigenous people that make up the concoction mainly, Biafra, Arewa and Oduduwa are not compatible. They are historically different in their background, religious beliefs and customs, and there is no willingness to unite. This unholy union concocted by Frederick Lugard in 1914, was created to last for only one hundred years (100), after which the indigenous peoples can go their separate ways, as written and signed in the Amalgamation Document. From 1st January 1914 to 1st January 2014 was one hundred years. By implication, the amalgamation of Nigeria expired 12pm of 1st January 2014. Anybody who is trying to hold back any indigenous person who wants to separate from Nigeria is defying the rules of engagement. It is an undeniable fact that Nigeria will disintegrate imminently, I do not know about Oduduwa and Arewa, but for the Indigenous People of Biafra, the restoration of Biafra is a sacrosanct task that must be accomplished, and within a stipulated time frame. Read also:JUST IN! THE AVENGERS BLOW UP 4 PIPELINES IN BAYELSA AND RIVERS STATE: THERE IS NO GOING BACK! 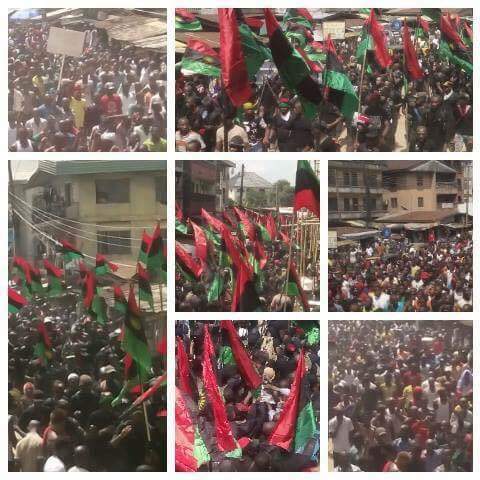 Biafrans have been patient enough to wait until after the expiration of Nigeria, before pushing hard for exit. We must make it clear to Muhammadu Buhari, the Mohammedan emirate and the creator of Nigeria, Britain, that the exodus of the Republic of Biafra is inevitable and it is not negotiable. We are not interested in the political, economic and religious razzmatazz of Nigerian government and their allies. We, the Indigenous People of Biafra all over the world are on our way to exit from this inorganic and fruitless marriage, under the leadership of Nnamdi Kanu (Prisoner Of Conscience). He will lead us out of this subjugation and dehumanization that has left us haggard and tattered. Nnamdi Kanu will lead us out from this death that seek to wipe us out from the surface of the earth, and lead us into the land of the children of God, Biafra, where there will no more gnashing of teeth. Nothing can stop the exit of Biafra from Nigeria. Free all Biafrans held in Nigeria cell! !